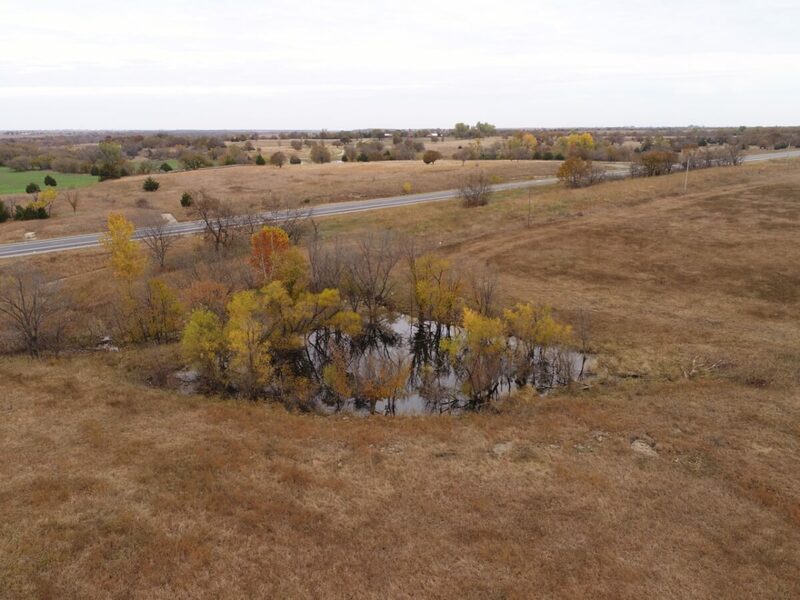 PROPERTY DESCRIPTION: 78.8+- acres with a mixture of tame grasses and bluestem grasses. A majority of the property has been utilized as hay meadow. Features include 2 ponds, blacktop US HWY 400 frontage, scattered trees and timber, and a cabin. The cabin has electricity but no water. Great place to use as a bunkhouse for relaxing summer nights or winter Kansas Whitetail Deer hunts. Excellent combination of agriculture and recreation. LEGAL DESCRIPTION: The East Half of the Northeast Quarter Section 7, Township 28 South, Range 10 East of the 6th PM, Greenwood County Kansas Less ROW. LAND LOCATION: 1 Mile east of Piedmont Kansas on HWY 400. Property is located at the southwest corner of HWY 400 & L Rd.